For some time now, I have been looking for the best communication process. It’s been interesting to research because so many people have totally different ideas. Through all this reading, there are only a few things that STAND out and I would like to share these with you. The importance of body language. Mehrabian conducted several experiments on non-verbal communications. His results: Only 7% of communication is Verbal. 38% is paraverbal (Meaning tone and intonation) and 55% body language. If you ask me… this is debatable, but he has made his point. Words alone are not enough to fully understand the message. The 7 C’s of effective communication: Clear, Concise, Concrete, Correct, Coherent, Complete, Courteous. In other words, to be understood, every time you communicate make sure the above is in your message. 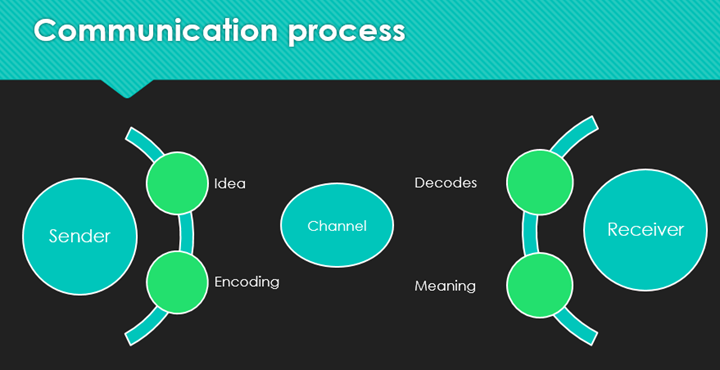 Just by looking at the communication process picture illustration below, you can understand why communication is an art. The encoding is determined by your beliefs, your values, the rules you have created, and the result you want. The decoding is determined by the same elements as the encoding but by the receiver and not the sender, who has totally different beliefs, values, and rules; and who wants something different. The main purpose of communication IS what the receiver has understood. This was a little surprising because I am normally the sender. So is what I am saying not important? ….. No! It’s not important, if the receiver has not understood it. There is no point to the message. Interesting right? to be able to repeat the conversation in the sender’s words. The above should happen even if you disagree. But to truly listen is to understand exactly what the other person is saying and feeling; and what they expect from you. WOW! Complicated! Join me for a session on effective communication.